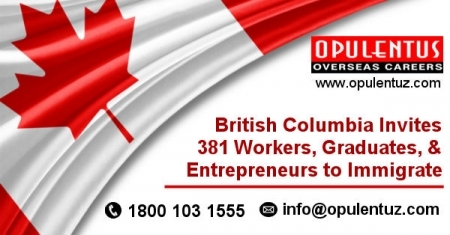 In the draws that took place on August 31st and September 6th different types of skilled workers, entrepreneurs and international graduates were invited to submit an application in British Columbia Provincial Nominee Program. Some of those who were invited can now submit their BC PNP application through an enhanced sub-category which is now aligned with the selection system of Federal Express Entry. When these candidates receive the nomination certificate, they stand to gain 600 additional points under the Comprehensive Rankings. The PR applications of other invitees will be processed outside of the Express Entry after receiving a nomination from British Columbia. The draw held on September 6th was specifically for 'tech-only.' This is a component of the fresh initiative taken up by the province in May 2017. British Columbia PNP had launched a Tech Pilot to help the technology sector to target and retain, professional talent required for the growth of the technology sector in the state. The Tech Pilot benefits both the skilled workers and the international graduates in the technological field in British Columbia. Eligible persons applying for Canadian immigration in the various categories of the PNP should enter into the Skills Immigration Registration System. Candidates get a score on entry into the pool. This score is held on the status of work experience and education. The top ranking candidates in the Skills Immigration Registration System pool are granted ITAs in periodic draws conducted by the government. The Skilled Worker category in Express Entry British Columbia is meant for international skilled workers, who have received their post-secondary education/training and gained employment experience in management, professional, technical, trade or other skilled occupation. Candidates must fulfill the eligibility criteria to enter the pool. An application in this category if successful fetches the candidate 600 points in the ranking and also helps in the ITA to follow at the federal level. International graduates hailing from a Canadian university/college during the past two years are eligible to apply under the Express Entry British Columbia International Graduate category. This category makes it possible for all eligible graduates graduating from any university /college located anywhere in Canada; and is not limited to graduates from universities/colleges based in British Columbia. This category too is aligned with the Federal Express system. This category is meant for workers having post-secondary education /training and job experience in skilled occupations. A job offer is needed. This category is meant for international students who have graduated from a Canadian university/college during the past two years of applying to the PNP. Prior work experience is not needed, but the applicants must get a job offer from an employer of British Columbia. This category is meant for candidates who are not eligible for other immigration programs. It permits non-skilled workers to apply for PR. Candidates are required to work in an occupation having eligibility in the hospitality/ tourism, food processing or trucking industries, or in the skill level C/D occupation in the NE Dev. The region of the province. This stream leads to Canadian PR for business people with experience, who can establish themselves or invest in the province. They must run a commercially successful business that benefits to the economy of the province. Applicants who Succeed can get a work permit and, when the business in the province meets certain requirements of the stream, they can apply for PR in Canada through the British Columbia PNP.